QRX ontvanger met 2x LA2 transmitter. Freq. range tx 102Mhz (596 - 698 MHz). freq. range rx 180Mhz (518 - 698 MHz). New design - extended range. 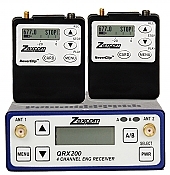 QRX ontvanger met 2x ZMT3 transmitter. Freq. range tx 102Mhz (596 - 698 MHz). freq. range rx 180Mhz (518 - 698 MHz). New design - extended range. QRX ontvanger met 2x LA2 transmitter. Freq. range tx 102Mhz (596 - 698 MHz). freq. range rx 36Mhz (614 - 650 Mhz). New design - extended range. TRX900AA Wireless microphone transceiver + RX900S stereo receiver. Schakelbereik 36 Mhz. Freq. 614 - 650 Mhz. Block 24. 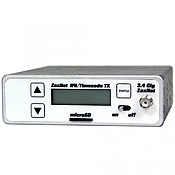 IFB200 Transmitter om tijdcode en ifb audio signalen naar de TRX tranceivers te sturen. Zaxcom 4 kanaals portable ontvanger. Freq. range rx: 518 - 698 Mhz (tuneable tracking filter). New design - extended range. Zaxcom 4 kanaals portable ontvanger. Freq. range rx: 614 - 650 Mhz. New design - extended range. 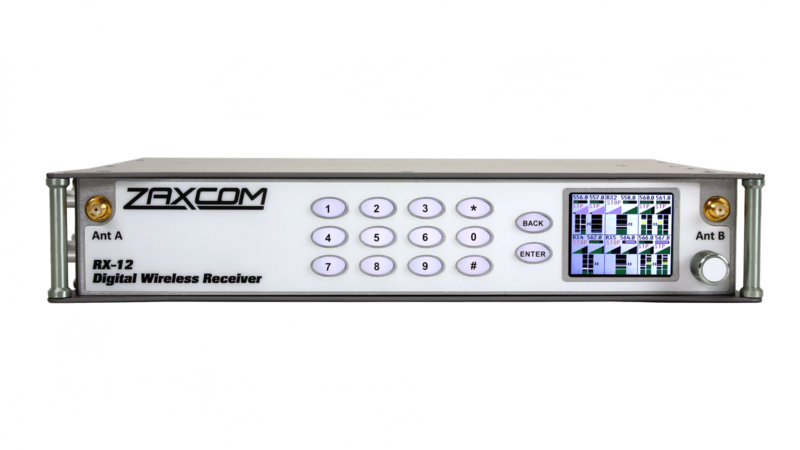 Portable wideband modular receiver assembly with integrated antenna distribution for bag or cart use. Rack mountable modular receiver assembly with integrated antenna distribution for bag or cart use. 2-channel wideband ENG slot-in receiver with SuperSlot, 512-698 MHz. 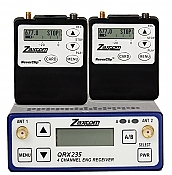 TRX743 Wireless Plug-on Transceiver (zender/recorder). Zaxcom beltpack zender werkzaam op 2x AA batterij. Schakelbereik 102 Mhz (596 - 698 Mhz). New design - extended range. 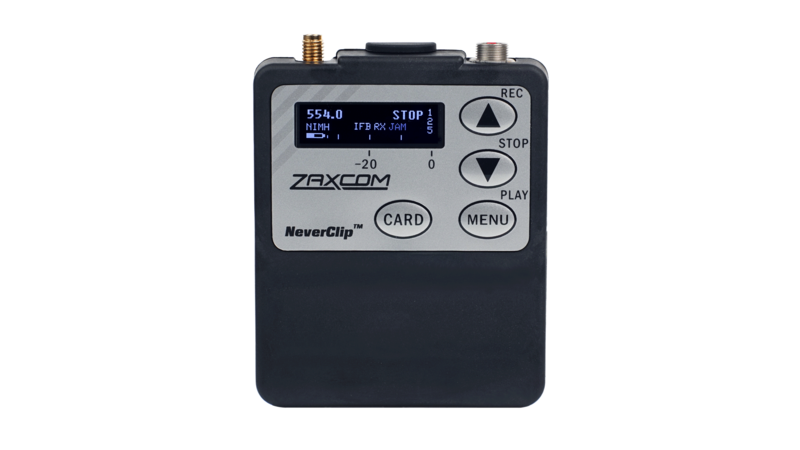 Audio recorder with timecode, NeverClip and built-in IFB receiver for timecode & remote control. 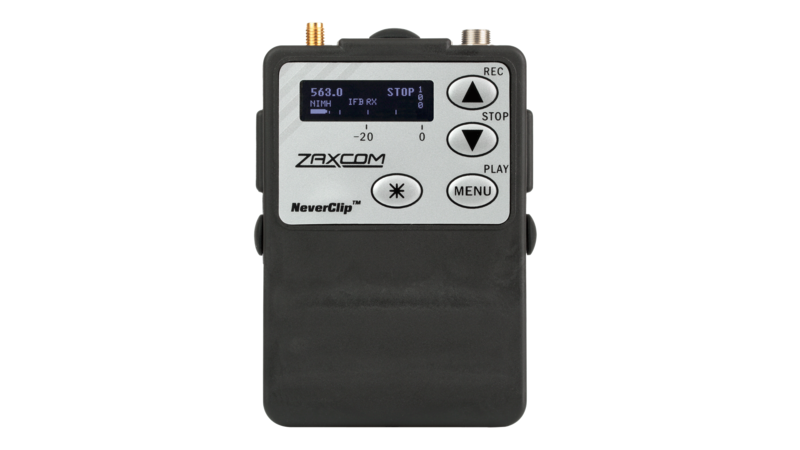 Zaxcom miniatuur beltpack zender en recorder, werkzaam op 1x NP-50 accu. Schakelbereik 102 Mhz. 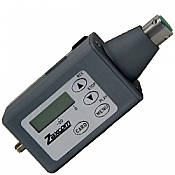 Zaxcom ultra-small wideband plug-on transceiver with phantom power and internal recording.